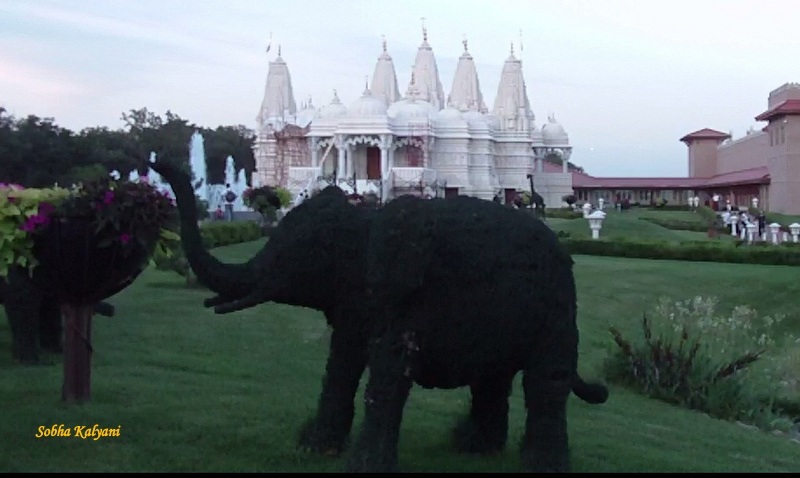 A visit to BAPS Swami Narayan Temple at Bartlett, IL. The first time visitors to BAPS Swami Narayan Temple in Bartlett (Chicago), IL will be awestruck at the marvelous Hindu temple architecture in the U.S. Visitors both Indian and foreigners keep clicking their cam at various places outside the temple premises. Taking pics inside the temple is prohibited. The temple structure stands majestic and is a masterpiece work of ancient Rajasthani style. The great workmanship of the Indian artisans on the white marble is highly appreciable. 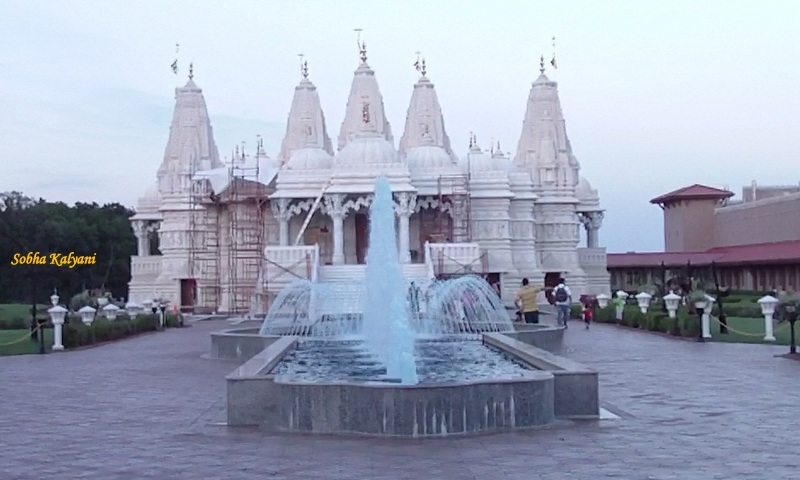 The temple represents a wonderful fusion of traditional Indian temple architecture with the modern technology. For constructing this temple, marble from Italy and limestone from Turkey were shipped to India where more than 3000 craftsmen from Rajasthan carved these into wonderful pieces in 22 months. BAPS (the abbreviated form of Bochasanwasi Sri Akshar Purushottam Swaminarayan Sanstha) Swami Narayan Mandir is located in a suburban area of Chicago called Bartlett in Illinois state. The temple remains open for visitors from 9 a.m till 7.30 p.m through out the year. Visitors can have Murti Darshan from 9 to 10.15 in the morning and again from 4 to 6 in the evenings. It's aarti time from 11.15 to 12 noon and again at 7 p.m it's time for sandhya aarti. During the visiting hours one can visit the Stone Mandir, Wooden Haveli and Understanding Hindu Dharma Exhibition. There is a dress code for visiting the mandir and visitors are supposed to strictly follow it. They need not wear sleeveless tops and shorts that are shorter than knee length. However, for the convenience of the visitors, wraps for tying around the waist are provided in the Haveli. Photography and taking videos is strictly prohibited inside the mandir, however visitors can take snaps outside the main mandir. There is a spacious free parking lot inside the temple. 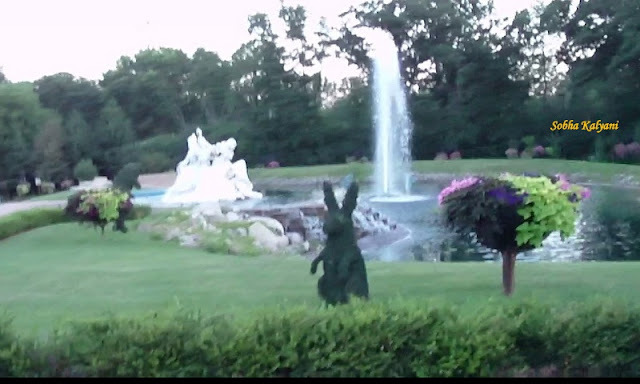 After parking the car, visitors hang around and spend lots of time in the serene surroundings with beautiful fountains, garden and shrubs cut in the shapes of elephants, rabbits etc. It's so pleasant being here to see mostly Indians moving around. You will be completely lost in a different world and forget yourself as you get immersed in nature. It's really beautiful and awesome. Most of the visitors visit this temple in summer months when there is lots of greenery and colorful blooms all around with fountains enhancing the beauty of the place. The finesse of the minute carvings by the highly skilled workmen of India, on the wood and on the marble is worth appreciation. The beauty of the marble and the fine carvings on it are doubled when the lights are on inside the temple and this is really worth watching. A visit to this temple in summer is enjoyable. The beautiful garden with fountains in front of the temple makes the atmosphere very pleasant. There is ample of parking lot at the rear of the temple and Indian visitors enjoy Indian vegetarian delicacies in the restaurant inside the temple.